Badi Pilustondi -Vidya Varotsavalu programme Schedule, Activities for AP Schools 2017, Instructions for implementation of “Badi Pilustondi -Vidya Varotsavalu” program during the period 12.06.2017 to 18.06.2017 in all AP Schools. Badi Pilustondi -Vidya Varotsavalu programme 2017 Schedule, Activities for AP Primary, High Schools. Rc.No.41/A&I/2017, Dt:10-06-2017: Sub: School Education Department- Conduct of “Badi Pilustondi -Vidya Varotsavalu” programme for the year 2017-18 from 12.06.2017 to 18.06.2017 -Conduct of programme and activities –Instructions Issued- Reg. 1. All children in the age group of 6-14 years shall be enrolled in the schools. There shall be no dropouts/ never enrolled children in any village. The RJDSEs, DEOs, PO’s are requested to personally monitor the “Badi Pilustondi - Vidya Varotsavalu” programme and take necessary steps for 100% participation of all the field functionaries in this programme making it a grand success. The MEOs and DyEOs may provide all the required support to the Headmasters and Teachers to make it a wonderful experience for all involved. 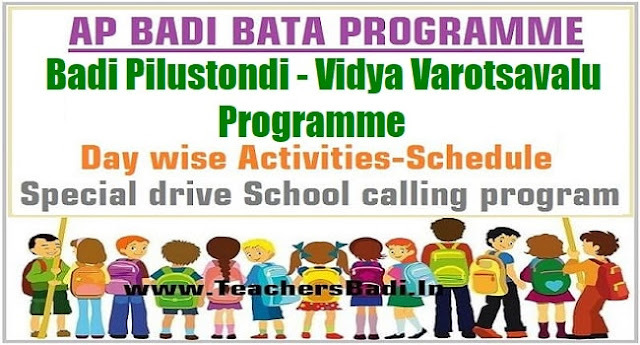 In order to achieve the objectives of the “Badi Pilustondi -Vidya Varotsavalu” programme, please ensure local public representatives and community participation and parents involvement in the day to day school level activities. Special food may be prepared and served during the MDM on each of the day. While the “Badi Pilustondi -Vidya Varotsavalu” programme is scheduled from 12.06.2017 to 18.06.2017, the spirit of the first week of school may be continued throughout the year. Please ensure that the children are provided with all the entitlements like, Text Books, Uniforms, Quality Mid-Day Meal, etc. Support of the School management Committee, local community, Alumni, NGOs, Corporates, etc. may be taken to improve the infrastructure as well as quality of education. The school grants allotted under SSA and RMSA program may be utilized fully and effectively to ensure clean environment and toilets at the school. The supervisory officers like, MEOs, Dy.EOs, DEOs, SSA and RMSA Team should frequently visit the schools and provide necessary support to the Headmasters and Teachers in addressing the problems, issues and gaps. Through effective monitoring, they should ensure that the children enrolled in the schools are retained, drop outs arrested, academic calendar is followed and that the student learning levels are improved. The details of the students enrolled earlier during the “Mana Vooru, Mana Badi” program and during the “Badi Pilustondi – Vidya Varotsavalu” program, may be submitted on 20.6.2017 after proper verification. The suggested day wise schedule of the “Badi Pilustondi -Vidya Varotsavalu” programme is appended here with for ready reference. Please ensure that the instructions reach all the schools and necessary action is taken without fail.